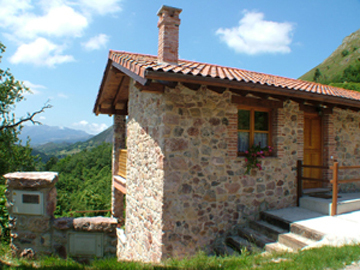 Two newly built rural apartments in Tresano, Cangas de Onís, a very tranquil setting on the edge of the Parque Nacional of the Picos de Europa. With stunning views of the Sierra del Sueve mountains, we are only 30 minutes from the coast, just ten from Cangas de Onís and fifteen from the Covadonga. Cangas de Onís is a lively city with many shops, bars and restaurants. It is considered to be the capital of the Picos de Europa and its most famous feature is the ancient roman bridge (Puente Romano) which spans the River Sella. The Covadonga is the birthplace of modern Spain, where the first king, Don Pelayo, began the rout of the Moors from a cave in the side of the mountain. This is now one of the holiest places in Spain with a sanctuary in the cave and an impressive basilica built at the end of the 19th century. Nearest airports are Oviedo/Avilés (Asturias) and Santander (Cantabria), both about an hour and half drive; and Bilbao (Basque Country), about two and a half hours away. Ferries from the UK land at Santander and Bilbao.